The NASA/NOAA JPSS-1 Satellite designed and built by Ball Aerospace Begins Final Preflight Processing at Vandenberg AFB. The global data from Joint Polar Satellite System (JPSS) will be used in numerical weather prediction models to help forecast extreme weather events and improve public warnings. 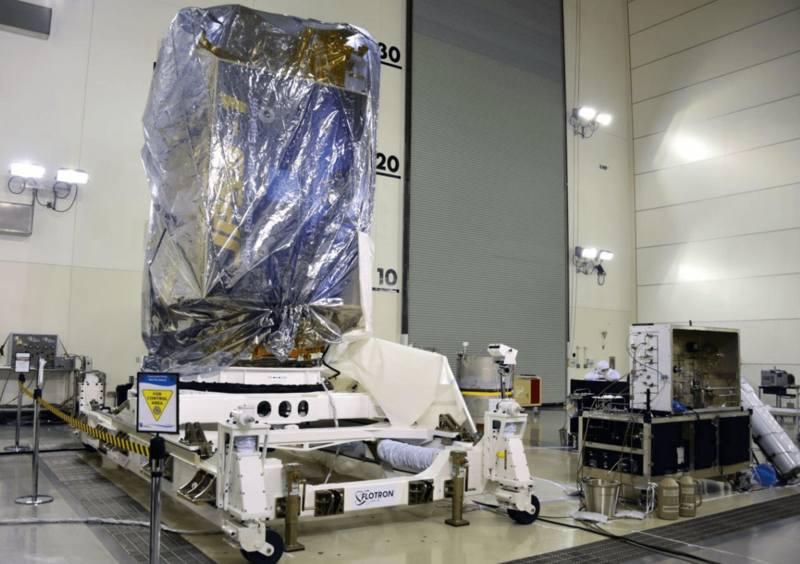 The satellite was assembled, transported to the launch site and then upended to the vertical orientation using a Flotron Satellite Positioner where it will be prepared for launch and integrated with the ULA Delta II launch vehicle. Flotron’s Mid-Size Satellite Positioner is designed to minimize risk to high value hardware by keeping the Space Vehicle (SV) on the same tool throughout processing activities. The SV can be lifted with an overhead and mounted to the Flotron interface in the vertical orientation, tilted down to provide technicians ergonomic access to all sides during integration and test activities, transported in this orientation through the facility to the shipping container via the tow bar and wheeled casters where it is loaded into the shipping container and transported by truck or air to the launch site. At which point, the Flotron with SV can be unloaded from the shipping container, rolled into the high bay, tilted vertically for final preflight processing and integrated with the launch vehicle. The overhung moment capacity of this Flotron Satellite Positioner is on the order of 750,000 in-lbs considering appropriate dynamic load factors and safety factors.